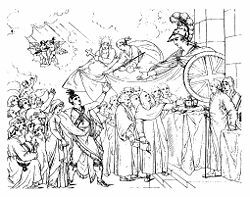 Britannia gives a hero's welcome to returning American Loyalists. If I must be enslaved let it be by a King at least, and not by a parcel of upstart lawless Committeemen. If I must be devoured, let me be devoured by the jaws of a lion, and not gnawed to death by rats and vermin. Seabury remained in America, like most Loyalists. He became the first Episcopal bishop in America. From the Loyalist perspective in 1775, the Loyalists were the honorable ones who stood by the Crown and the British Empire. However, once independence was declared in 1776, Loyalists who continued to support the Crown were treated by the Patriots as traitors who turned against their fellow citizens and collaborated with a foreign army. By July 4, 1776, the patriots controlled virtually all of the territory and population of the 13 states, and demanded that no resident show loyalty to a foreign power. Neutrality, however, was permitted. The British returned and in September 1776, defeated the American army and captured New York City and Long Island, which they occupied until 1783. From time to time, they controlled various cities such as Boston (1775–6), Philadelphia (1777), Savannah (1778–83), and Charleston (1780–82), and various slices of countryside. However, 90 percent of the population lived outside the cities. The result was that the American state governments controlled 80 to 95 percent of the population. The British recalled all their colonial governors and never allowed the Loyalists to set up any government, with one exception. Great Britain did reestablish its colonial governor in coastal Georgia 1779–82, with the Rebels in control upstate. Elsewhere, the British were normally only in control through Army and Royal Navy activity. In Canada, American agents were active, especially John Brown, agent of the Boston Committee of Correspondence, along with Canadian–American merchant Thomas Walker and others, during the winter of 1774–75. They won many inhabitants to sympathize with Congress. However others—probably a majority—remained neutral and refused to join the militia which the British had called out to protect against the American invasion in late 1775. Only a minority expressed loyalty to King George: About 1500 militia fought for the King in defense of Montreal. In the region south of Montreal occupied by the Americans, the inhabitants supported the Americans and raised two regiments to join them. In Nova Scotia, with a large Yankee settlement but a powerful British naval base, neutrality prevailed. Loyalists were reportedly tarred and feathered by patriots who would strip the loyalist of their clothing and make them watch the tar boil. The patriots would then pour the tar over the man and make him roll in feathers. The tar was very hard to clean off and the blistered skin underneath usually came off with the peeled tar. In no colony did loyalists outnumber revolutionaries. The largest numbers were found in the middle colonies: Many tenant farmers of New York supported the king, for example, as did many of the Dutch in the colony and in New Jersey. The Germans in Pennsylvania tried to stay out of the Revolution, just as many Quakers did, and when that failed, clung to the familiar connection rather than embrace the new. Highland Scots in the Carolinas, a fair number of Anglican clergy and their parishioners in Connecticut and New York, a few Presbyterians in the southern colonies, and a large number of the Iroquois Indians stayed loyal to the king. Johnson Hall, seat of Sir John Johnson in the Mohawk Valley. New York City and Long Island (controlled by the British from 1776 to 1783) had the largest concentration of Loyalists, many of whom were refugees from other states. Loyalists tended to be older, more likely merchants, wealthier, and better-educated than their Patriot opponents, but there were also many Loyalists of humble means. Many active Anglicans remained loyal to George III of Great Britain|King George III]]. Some recent emigrants, especially Scots, shared Loyalist views. Loyalists in the South, however, were suppressed by the local Patriots who controlled local and state government. Many people—such as some of the ex-Regulators in North Carolina—refused to join the rebellion as they had earlier protested against corruption by the local authorities who later became rebel leaders. Such pre-Revolutionary War oppression by the local Whigs contributed to the reason that much of back country of North Carolina tended to loyalism or neutrality. Approximately half the colonists of European ancestry tried to avoid involvement in the struggle—some of them deliberate pacifists, others recent emigrants, and many more simple apolitical folk. The patriots received active support from perhaps 40 to 45 percent of the white populace, and, at most, no more than a bare majority. In 1775, Royal Governor Dunmore in Virginia called on slaves of Patriot owners (not Loyalist owners) to flee and join his army. About 300 did so. They fought one battle, wearing the motto "Liberty to Slaves." After the battle about half died of disease in British camps and the so-called Ethiopian Regiment was disbanded. About 5000 blacks served in the Continental army, and slaves who fought in that Army for a set period were often legally emancipated. Thousands more served in militia and state units. Very few free blacks became Loyalists. As the war ended, Loyalist slave owners took an estimated 75,000 to 100,000 slaves with them; some had been captured from Patriot owners. They were usually taken to the British sugar colonies in the West Indies, like Jamaica, where life expectancy was short. About 400 to 1000 free blacks went to London and joined the community of about 10,000 free blacks there. About 3500 to 4000 went to the British colonies of Nova Scotia and New Brunswick, where the British provided many with land. More than 1,500 settled in Birchtown, Nova Scotia, instantly making it the largest free black community in North America. However most of the 1,500 were dissatisfied and left Nova Scotia for the new British colony of Sierra Leone in Africa after 1787, where they became part of the ruling elite. The largest concentration of Loyalists was in New York City and Long Island which was controlled by the British Army from September, 1776 until the evacuation in late 1783. Many Loyalist families fled to New York City, where they considered themselves safe under military rule. Britain reestablished a colonial government in parts of Georgia, but nowhere else did it attempt to restore colonial civil government in which Loyalists might participate, governing instead by military rule. In Patriot controlled areas—that is, most of the country—Loyalists were subject to confiscation of property. Outspoken supporters of the King were threatened with public humiliation (such as tarring and feathering) or physical attack. However, relatively few Loyalist civilians are thought to have been killed by mobs; two men in Philadelphia were officially executed for supporting the British. In September 1775, William Drayton and loyalist leader Colonel Thomas Fletchall signed a treaty of neutrality in the interior community of Ninety Six, South Carolina. In October 1775, Congress passed a resolution calling for the arrest of all loyalists who are dangerous to "the liberties of America." The Loyalists rarely attempted any political organization. They were often passive unless regular British army units were in the area. The British, however, assumed a highly activist Loyalist community was ready to mobilize and planned much of their strategy around raising Loyalist regiments. The British provincial line, consisting of Americans enlisted on a regular army status, enrolled 19,000 American loyalists (50 units and 312 companies). Another 10,000 served in loyalist militia or "associations." The maximum strength of the Loyalist provincial line was 9,700, in December 1780. In all, about 50,000 at one time or another were soldiers or militia in British forces, including 15,000 from the main Loyalist stronghold of New York. 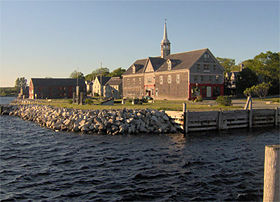 Shelburne, Nova Scotia, a major early destination of Loyalist refugees. The vast majority of the Loyalists (300,000 to 400,000) remained in America during and after the war. Starting in the mid-1780s, a small percentage of those who had left returned to the U.S. Following the end of the Revolution in 1783, Loyalist (especially soldiers and former officials) could choose evacuation. Loyalists whose roots were not yet deeply embedded in the New World were more likely to leave; older men who had familial bonds and had acquired friends, property, and a degree of social respectability were more likely to remain in America. About 15–20percent of the Loyalists left, an estimated 70,000 Loyalists, or about 3 percent of the total American population. About 46,000 went to Canada; 7,000 to Great Britain and 17,000 to British colonies in the Caribbean. About 32,000 went to Nova Scotia, where they were not well received, so the colony of New Brunswick was created for them. About 10,000 went to Canada, especially the Eastern Townships of Quebec and modern-day Ontario. The Haldimand Collection is the main source for historians in the study of American Loyalists settlement in Canada. The initials "U.E." are rarely seen today, but the influence of the Loyalists on the evolution of Canada remains. Their ties with Great Britain and their antipathy to the United States provided the strength needed to keep Canada independent and distinct in North America. The Loyalists' basic distrust of republicanism and "mob rule" influenced Canada's gradual path to independence. In effect, the new British North American provinces of Upper Canada (the forerunner of Ontario) and New Brunswick were founded as places of refuge for the United Empire Loyalists. The richest and most prominent Loyalist exiles went to Great Britain to rebuild their careers; many received pensions. Many Southern Loyalists, taking along their slaves, went to the West Indies and the Bahamas, particularly to the Abaco Islands. Thousands of Iroquois and other Native Americans were expelled from New York and other states and resettled in Canada. The descendants of one such group of Iroquois, led by Joseph Brant Thayendenegea, settled at Six Nations of the Grand River, the largest First Nations Reserve in Canada. A group of Black Loyalists settled in Nova Scotia but, facing discrimination there, emigrated again for Sierra Leone. The great majority of Loyalists never left the United States; they stayed on to become citizens of the new country. Some became nationally prominent leaders, including Samuel Seabury and Tench Coxe. Some exiles returned, as the Massachusetts story confirms. Of those who left Massachusetts, virtually all expressed a desire to return to what they considered their native home. After the last wave of anti-Toryism passed in the wake of the peace treaty of 1783, a number of Loyalists, typically young, native born, and still emotionally attached to the area, made their way back to Massachusetts between 1784 and 1789. On reentering Massachusetts, they encountered, for the most part, a warm welcome from anti-Toryists and were able to integrate themselves into society, reclaiming property, collecting debts, and joining the conservative, Federalist political culture of the state. Count Rumford (Benjamin Thompson) was a loyalist who fled to London when the War began. He became a world class scientist, a founder of thermodynamics and famous also for research in artillery ordnance. His expressed a desire to return to the United States in 1799, and was eagerly sought by the Americans (who needed help in fighting the Quasi-War with France). Rumford eventually decided to stay in London because he was engrossed with establishing the Royal Institution in England. Mary Ball Washington, the mother of George Washington, was born as Mary Ball in 1708 in Lancaster County, Virginia. She was the only child of Joseph Ball and his second wife, Mary Johnson, born Montagu. She met Augustine Washington, whom she married in 1730. Augustine died in 1743. She never remarried, unlike most widows in Virginia. She lived to see her son, George Washington inaugurated as president in 1789, but died four months later. She was buried on the Lewis plantation a few steps from "Meditation Rock," which tradition says was her favorite retreat for reading, prayer, and meditation. ↑ History News Network,Only 1/3rd of Americans Supported the American Revolution? Retrieved June 20, 2007. ↑ Seabury, Letters of a Westchester Farmer, 1774–1775 (1970), p 61. ↑ The New Georgia Encyclopedia, Revolutionary War in Georgia. Retrieved June 20, 2007. ↑ Mason Wade, The French Canadians (1955) 1: 67–9. ↑ Robert Middlekauff, The Glorious Cause: The American Revolution, 1763–1783, The Questia Online Library. Retrieved June 20, 2007. ↑ Robert M. Calhoon, in A Companion to the American Revolution (Blackwell Publishers, 2000), p. 235. ↑ McDonnell, in A Companion to the American Revolution (2000). ↑ Africans in American, The Revolutionary War. Retrieved June 20, 2007. ↑ Benjamin Quarles, Black Mosaic: Essays in Afro-American History and Historiography (1988). ↑ Bob Blythe, The Unfinished Revolution The Odyssey of the Black Loyalists, The American Revolution. Retrieved June 20, 2007. ↑ Halmimand Collection, Homepage. Retrieved June 20, 2007. Bailyn, Bernard. The Ordeal of Thomas Hutchinson. Cambridge, Mass: Belknap Press of Harvard University Press, 1974. ISBN 9780674641600. Borden, Morton, and Penn Borden. The American Tory. Englewood Cliffs, N.J.: Prentice-Hall, 1972. ISBN 9780130313935. Bradley, James E. "The Reprieve of a Loyalist: Count Rumford's Invitation Home." New England Quarterly 1974 47(3): 368-385. Brown, Wallace. The King's Friends; the Composition and Motives of the American Loyalist Claimants. Providence: Brown University Press, 1965. Calhoon, Robert M. The Loyalists in Revolutionary America, 1760-1781. New York: Harcourt Brace Jovanovich, 1973. ISBN 9780151547456. Calhoon, Robert M., Timothy M. Barnes, and George A. Rawlyk. Loyalists and Community in North America. Westport, Conn: Greenwood Press, 1994. ISBN 9780313289477. Jensen, Merrill. The New Nation: A History of the United States During the Confederation 1781-1789. New York: Vintage Books 1950. Kermes, Stephanie. "'I Wish for Nothing More Ardent upon Earth, than to See My Friends and Country Again': The Return of Massachusetts Loyalists." Historical Journal of Massachusetts 2002 30(1): 30-49. Kerber, Linda K. Women of the Republic: Intellect and Ideology in Revolutionary America. Chapel Hill: Published for the Institute of Early American History and Culture by the University of North Carolina Press, 1980. ISBN 9780807814406. Knowles, and Cecilia Morgan. REVIEWS—Inventing the Loyalists: The Ontario Loyalist Tradition and the Creation of Usable Pasts. The Canadian Historical Review. 79 (4):768 1998. Potter-MacKinnon, Janice. The Liberty We Seek: Loyalist Ideology in Colonial New York and Massachusetts. Cambridge, Mass: Harvard University Press, 1983. ISBN 9780674530263. Quarles, Benjamin. Black Mosaic: Essays in Afro-American History and Historiography. Amherst: University of Massachusetts Press 1988. ISBN 9780870236051. This page was last modified on 2 August 2018, at 15:30.